Concerns Rise As Famed Buccaneer’s Den Guild Gets New Leader, Maritime Trade Cargo At Risk! 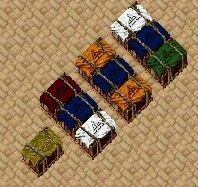 Startling news out of Buccaneer’s Den as whispers turn to shouts over the new leader of “The Guild”. “The Guild” has long been the island’s premier, yet loosely organized, outfit for pirates, marauders, thieves and other professions of ill-repute. That seems to have changed recently as a new leader called Hook has emerged with the stated goal of empowering “The Guild” to new heights of infamy. Merchant mariners are no doubt troubled by this news and fear their cargo could be at risk. Reports from the Royal Navy are reassuring, yet take on a somber tone, underscoring the speedy timeline by which Hook and “The Guild” have deployed spotting ships called Plunderbeacons on the majority of Britannia’s major shipping routes. Some reports suggest these bizarre looking ships have even been seen in the far away islands of Tokuno. 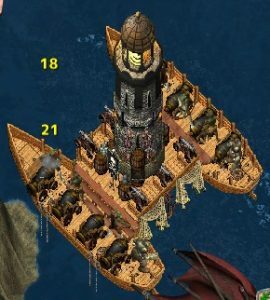 Despite the concern, the news of Hook’s efforts were matched by an announcement from the Society of Shipwrights indicating a major breakthrough in ship-to-ship combat technology. Tinkers have refined the cannon firing process allowing ships to release an even more deadly barrage of cannon fire than ever before. Similar news comes from the Society of Smiths, Mining Cooperative, Society of Clothiers, and Guild of Arcane Arts. In a joint announcement the groups report that advances in the production of cannonballs, grapeshot, powder charges, fuse cord, and their associated ingredients have been made making the stockpiling of those materials easier then ever. Despite the reported silver lining, Merchants are on edge as Maritime Trade Cargo has no doubt been redirected to Black Market Merchants on Buccaneer’s Den instead of their intended destination. 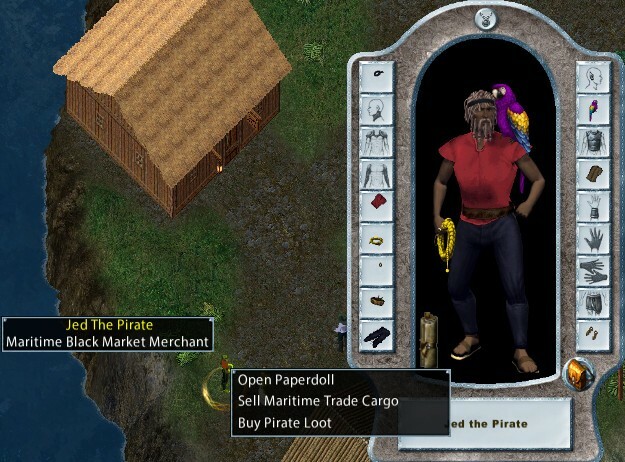 Mariners who recover this cargo are encouraged to complete the delivery of those items, but City Governors fear the allure of Black Market goods may tempt some to assist bolstering the pirate’s treasury. Are they right to worry? The allure of the pirates goods may well persuade some mariners to forgo delivering the cargo to the trade minister at the intended destination, earning loyalty to the town and much gold for the town’s coffers. Inexperienced sailors are advised to consult The Ship’s Guide and Cannons before embarking on voyages. Mariners beware these vessels, those 25 pounders hit hard! To clear the sea of one of these menaces you must first take on the guardians, most safely done by standing off the corners of the structure and engaging with your ship’s crew; archers, throwers, mages, tamers’ magic using pets will be most effective. Bards are advised to use despair and tribulation. Once the guardians are removed you can safely employ your cannons in broadsides to sink the construction. Large numbers of sea creatures are also drawn to the vicinity and may hinder your navigation. When fighting ships, merchant or pirate, cargo can be found by looting the crew, the deck chests and crates and the ship’s hold. It is rumoured that all mythical cargo is retained by the plunderbeacons. a shoulder parrot, as seen on his shoulder, 100,000 doubloons. A comparison of these costings with the gold gained by the city to which the goods are consigned is staggering, a grandmaster cargo, if delivered to the intended city, will swell the coffers by not 100gp, but 100,000gp or more, with a mythical cargo earning the city approximately 10,000,000gp. Delivery to a different Britannia city trade minister will gain that city approximately half as much. Let your conscience be your guide!